Thrissur Pooram Exhibition 2014 or commonly known as the All India Agricultural, Industrial, Educational and Cultural Exhibition is an exhibition organised jointly by Paramekkavu Bagavathi Temple Devaswom and Thiruvambadi Sri Krishna Temple Devaswom, ahead of Thrissur Pooram in Thekkinkadu Maidan in Thrissur city. 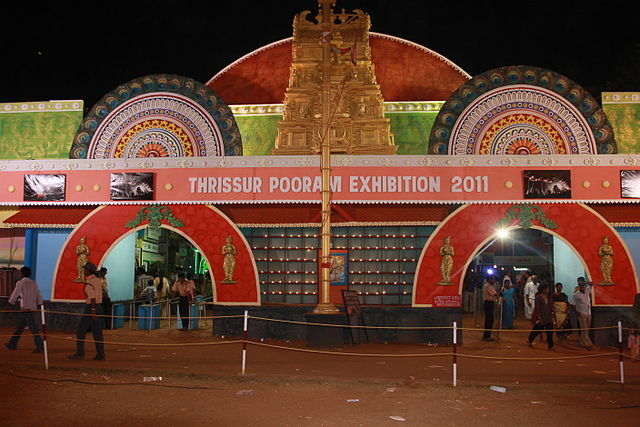 Thrissur Pooram Exhibition 2014 will be held from 1 April 2014 to 22 May 2014. Date – 1 April 2014 to 22 May 2014. Some of the main participating organizations will be Coir Board, Kerala Police, Kerala Excise, Indian Railways, All India Radio, Bharat Petroleum, Bharat Electronics, Bharat Earth Movers, Bharat Sanchar Nigam, Kerala Forest Department, Food Corporation of India, Coconut Development Board, Hindustan Newsprint Limited, Kerala Agricultural University, Hindustan Aeronautics Limited.